So, some may have noticed that my postings have dropped off a little as of late. I wish I had the sheer tenacity (and talent) of Darwin Wiggett, Stephen Desroches, or the inestimable Amber Richards, who somehow manage to post photos almost every day! But alas! I am not so prolific. But it isn’t because I am not out shooting. Honest! The truth is that after a day spent working on a computer – I’m an editor by trade – I don’t relish the idea of coming home to sit at a computer to process images. I don’t even own a copy of Photoshop or Lightroom – just the software that came with my camera, which is kind of a pain when Ijust want to crop something. Lee Sacrey recently asked a question on his blog: what is it you like about photography? Great question! And one that got me thinking; why do I press the shutter? Well, there are a lot of reasons really, probably some I don’t quite understand yet. I love to be out in nature, or anywhere really, and photography helps me to get out the door more often. I like the challenge of doing something I feel is creative and interesting. Mostly, I think I really like that photography pushes me question how I see the world, and to try and see it differently; to reconsider everything I thought I knew about a place and look at it again with fresh eyes. But I am not keen on processing, that much I know – it makes my eyes fuzzy. Anyways, thanks to Lee for the philosophical nudge, and to Amber and Darwin for the inspiration to get posting again! 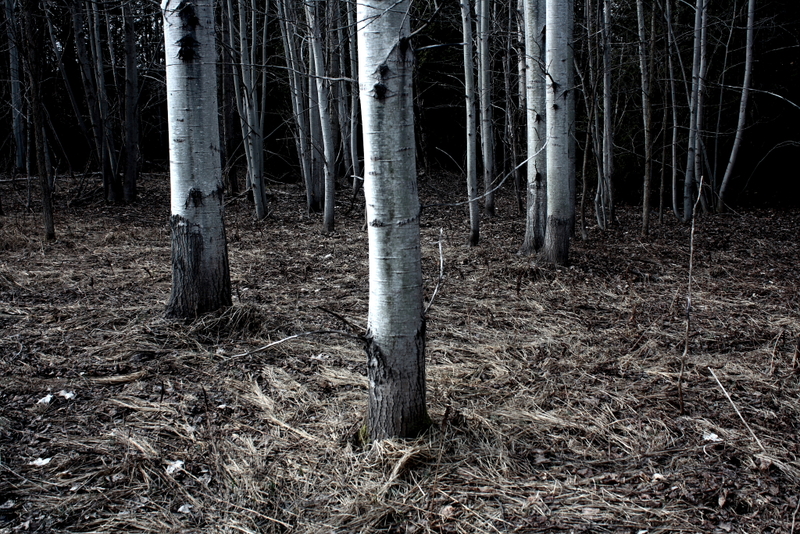 This one is of some birch trees in the bush at Gamblane Farms. I am actually quite proud of this one. Enjoy! I love this image of the birch trees. It feels so mysterious and almost creepy while being beautiful at the same time. Thanks Amber! I was really happy with how this one turned out. Glad you like it too! I downloaded Picasa the other day, and so far it’s pretty neat. Some very cool features. Thanks for the recommedation. Always happy to link to your site. Your work is awesome! Thanks Amy! I’ll have to have a look at those programs and start tinkering. Always glad to have your input on here. I was lucky enough to ‘acquire’ a copy of photoshop about 5 years ago from a friend – granted, I’m no professional with it, but it has been a lifesaver at times. Other people I know use a program called Gimp. Google it; it should be a free download, and works very similar to Photoshop. I used to be able to do quick cropping and other simple fixes right on Windows Vista photo preview. But now that I’ve made the move to Windows 7, that option is no longer available. Now I turn to Windows Live Photo Gallery. Download it straight to your computer from the Windows Live download site (same place you’d get MSN). Open your photos right on your computer with this little program and you can do quick fixes like cropping and brightness adjusting, and even straightening for those pesky crooked horizons.